Feeding Directions:Layers - Feed Manna Pro® Oyster Shell to layers free choice in a separate feeder, or add 1 pound to 20 pounds of layer feed. 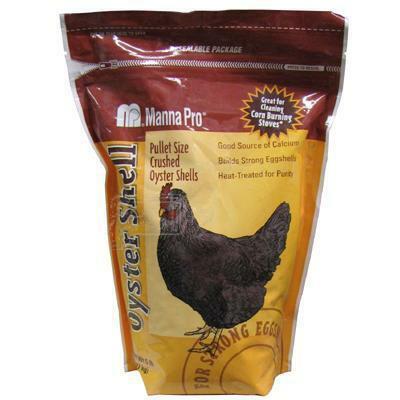 Pullets - Provide Manna Pro® Oyster Shell to pullets starting at 18 weeks of age and continue feeding through the entire lay period. Oyster Shell is recommended by some corn-burning stove manufacturers as an additive to promote clean burning, especially when the corn fuel is high in starch. Please consult your stove's manual to see if Oyster Shell is recommended for your stove and follow the manufacturer's directions for use precisely. Burning Oyster Shell is NOT a substitute for daily cleaning of your corn-burning stove. Regular chimney inspections are always recommended. Oyster Shell does not take the place of inspection and professional cleaning of your chimney. For improved safety and home heating efficiency, it is recommended that all chimneys and vented appliances be inspected every year by a certified chimney sweep.